Tour Wine-d Up: Hot Dub Wine Machine 2017 – The first ever vintage of Hot Dub Wine Machine is bottled up and on the shelf. A fine year indeed! You’ve heard it through the grapevine, Hot Dub Wine Machine went damn fine, baby! 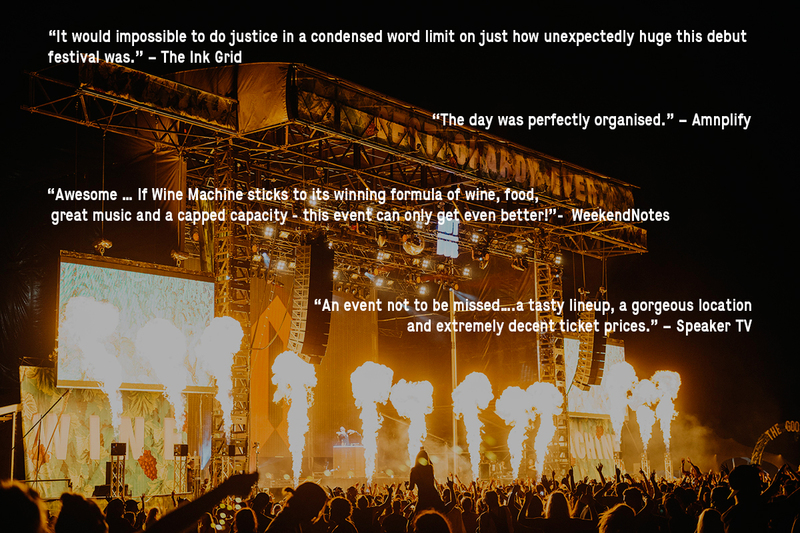 The inaugural Wine Machine national tour is now officially complete, having concluded five sold-out dates with a flawless finale in Western Australian wine region last weekend. From the outset, there were huge expectations of Wine Machine; which presented a new hope for live-music and wine/food/travel lovers looking for an event experience that delivered beyond the status quo, and we’re thrilled to report that Wine Machine rosé to the occasion, delivering on its promise of “full-bodied days of gourmet food, wine, craft beer and live music: get-togethers in the sunshine among the vines of our country’s greatest wineries”. Of course, getting a brand new touring concert off the ground in 2017 was not an easy cask. Regional wineries as venues were unchartered territory as far as contemporary music gatherings go. But then, something happened. First, the tour sold out. Everywhere. Then, as it wound through Australia’s wineries, report after report of “the best day of my life” rolled in and kept the smiles permanently affixed at Wine Machine HQ, who are happy to confirm the return of the tour in 2018. Yarra, on the other hand, turned it on, with rays of glorious sunshine illuminating the sweeping, panoramic views over the Yarra Ranges from Rochford Estate, in the heart of the Yarra Valley. The stunning boutique vineyard played hosts to thousands of Melbournites, who gathered around oak-barrel table settings to enjoy Rochford wines and good times. Times which flowed at Somerset Valley, although Wine Machine almost didn’t happen after Cyclone Debbie wreaked havoc on Queensland! The skies cleared just in time for a hugely pleasant, sunshine-soaked Autumn’s day by a lakeside stage at Ocean View Estate Winery. Delighted Brisbanites were treated to a surprise late inclusion on the bill by way of Aussie electronic hitmaker Hayden James, and one lucky competition winner also made a grand entrance to Somerset Valley via chopper. And then our last location – Perfect Perth. The biggest show of the tour went off without a hitch at the spectacular Houghton Winery, where stately pines created a lush, forest-like centre for the day’s Dubbers. And there, cocooned in kilometres of verdant vines, they danced and danced until the music stopped. Hot Dubbers there from early on experienced not just the best conditions for picnicking before the party crowds kicked in; but also some of the best sets of the tour. Purple Sneakers dubbed Paces’ Hunter Valley set “the most exciting set of the day”, with on-point visuals from Ego, fun back-up dancers, and Guy Sebastian joining the Gold Coast producer du jour for an incredible live rendition of their Like A Version of LDRU‘s ‘Keeping Score’. Trio Crooked Colours likewise impressed across Hunter, Somerset and Perth, drawing comparisons to Glass Animals with their cool demeanour and layered, moody indie-tronica pieces, while in Yarra Valley, Confidence Man, fresh from their Golden Plains coup d’etat, delivered plucky dance-pop and individuality in spades; and were one of the most buzzed-about aspects of the day (along with stars of Channel 10’s The Bachelorette getting their grape on!). Singer Kira Devine, who sings vocals on Chameleon, was an instant hit with audiences. A larger-than-life presence, Devine emanated a genuine warmth onstage and off – the spotlight was drawn to her (as were the photographers – our official tour photographer Pat Stevenson produced several stunning shots of Devine that you can [access here].) And he may be little, but Young Franco rose to the big task of playing before headliner Hot Dub across the majority of the tour. The bespectacled Brisbanite “sailed through an infectiously stacked set no one could help dance to,” (SpeakerTV), and was a particular hit with his hometown crowd at Somerset Valley. At each Wine Machine an onscreen countdown clock began during Franco’s sets, ticking down the minutes until the wine king himself, Hot Dub Time Machine would hit the stage, and by the time he did, crowd excitement had hit fever pitch. At each leg, the indefatigable Sydney master DJ Tom Loud rolled out his own signature two-hour, time-travelling dance party. Hot Dub’s sets were pure, unadulterated magic. “Hot Dub’s forever entertaining,” said X-Press Mag of his Swan Valley Wine Machine show, “for someone who hasn’t created a track himself, he has created something damn amazing that’s for sure.” There wasn’t a song, or decade, that wasn’t received with an ecstatic screaming back of lyrics and the uninhibited dance moves that erupt when one is a few chardys deep. The signature Hot Dub party tricks were pumped up across all Wine Machines – confetti and streamers now accompanied with fireworks, soaring co2 flames, and human-sized inflatable balloons emblazoned with Hot Dub’s insignia, the latter creating a colourful visual spectacle as Tom Loud sent Daft Punk’s suitably appropriate lyrics ‘celebrate and dance so free’ soaring out into the cool night air. Chardy cameos from leading Australian musicians came at every stop of Wine Machine – in the words of Purple Sneakers, “special guests aren’t just reserved for Coachella…it’s just bloody cool to see the support within the Aus music community for other [their fellow] artists.” Hunter Valley highlights came during Hot Dub’s set by way of a kilted-up Guy Sebastian (who had previously performed with Paces) who belted out a heart-stopping rendition of You’re The Voice, accompanied by The Scottish National Bagpipes, and the 90s decade of Hot Dub’s Hunter set came accompanied by bonus Peking Duk rap antics. While the Wine Machine shows weren’t the biggest Hot Dub – whose taken on gigantuan UK festivals – has played, creating and headlining your very own boutique event is undoubtedly a career pinnacle. 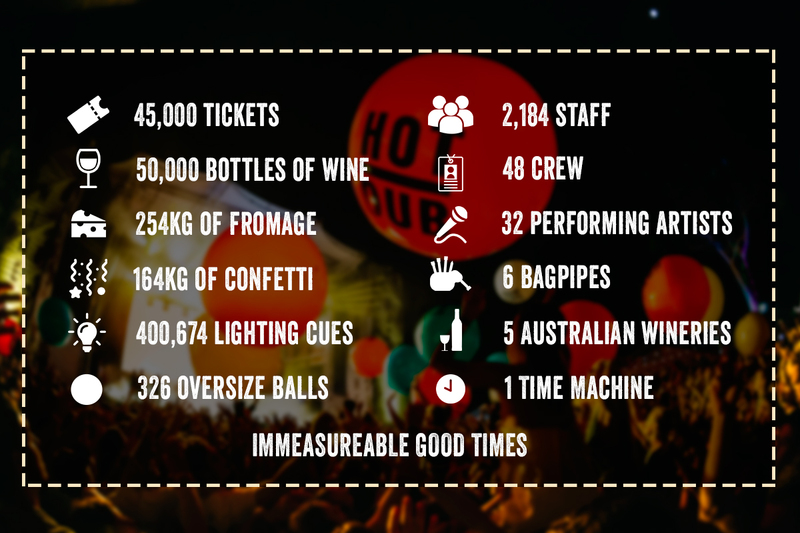 As he drank a glass of celebratory champagne backstage after the last set of the last festival, the exhausted but deliriously happy Sydney DJ called it “the funnest time of [his] life”. From everyone at the Chateau De Falcone, thank you for the support you’ve given to the inaugural Hot Dub Wine Machine tour. We appreciate every last word. See you at next year’s chardy.